Born to the Saxon nobility, he received a pious upbringing and was noted for his charity to the poor from an early age. Educated in Germany, and received his masters degree in theology at the University of Paris. Joined the Order of Preachers in 1220 under Saint Dominic himself. Prior-provincial of the Order in Lombardy, Italy in 1221. Succeeded Dominic as master-general of the Order in 1222. Under his administration, the Order spread throughout Germany, and into Denmark. A noted and powerful preacher; one of his sermons brought Saint Albert the Great into the Order. Wrote a biography of Saint Dominic. His writings on Dominic and the early days of the Order are still considered a primary sources. Spiritual director of Blessed Diana d'Andalo, and helped her found the monastery of Saint Agnes. Daughter of a Paduan nun who had been seduced into ignoring her vow of chastity; Lucrezia grew up in the convent. She felt a call to the religious life, which many of the sisters of opposed due to the scandal of her birth. The bishop approved of her vocation, however, and she entered her novitiate as a Benedictine nun in 1461, taking the name Eustochium. For four years she suffered from violent, hysterical fits. She was considered to be possessed, imprisoned, fed on bread and water, periodically starved and repeatedly exorcised. When her abbess fell ill, she was accused of poisoning the woman, and had to be saved from a mob of townspeople who wanted to burn her as a demon. Between these bouts, she was gentle, pious, patient and humble, apparently seeing it all as a form of penance. Her confessor and spiritual director insisted that she be allowed to continue with her vocation, and her sanctity won over many of the sisters who had opposed her. She died very soon after her formal vows. The name of Jesus was found cauterized on her breast. She is venerated in Padua. Hermit from age 18. Miracle worker. There are a couple of stories attached to Martinian; in them the line between fact and a good story probably blurs a little. Legend says that one day a miserable, bedraggled woman named Zoe showed at his door requesting a traveller's hospitality. He took her in, but her true colors soon showed as she cleaned up and showed herself to be a beautiful woman who tried to seduce Martinian. When he realized how tempted he was, he built a fire and put his feet in it; the pain, as you might imagine, was excruciating. Martinian said, "If I cannot stand this fire, how will I tolerate the fires of Hell?" He counseled her while she treated his wounds, converted her, and she became a nun in Bethlehem. To save himself from his own weakness, the saint moved to a large rock surrounded on all sides by the sea. There he lived on bread and water brought to him by a Christian sailor who visited three times a year. After six years living exposed on the rock, he had a visitor - a young woman who washed up on the rock after her ship had gone down at sea. Before she could speak, he gave her all his provisions, promised to send his friend the sailor to rescue her when he returned, then threw himself into the sea. He washed up on shore, and two months later had the girl rescued. He then spent the rest of his days in Athens. Daughter of a physician. Married to a stone cutter, but widowed very young. She became mistress to a soldier, and bore his son, but the child died as an infant. Married a second time, she was widowed when the man was killed in a fight with a jealous rival. Realizing that her life was completely out of control, she had a conversion, became an Augustinian tertiary, took the name Christina, gave herself over to Christ, and imposed severe austerities on herself as penance for her earlier ways. Lived in a number of Augustinian convents, became known as a miracle worker, and was on a pilgrimage to the Holy Sepulchre when she died. Raised in a poor Christian family, Paulus worked as a shepherd in his youth, and had little education. Feeling a call to the priesthood, he entered seminary at age 24; because he had no Latin, he was allowed to study philosophy and theology in Chinese. Ordained in his early 30’s, Father Paulus served as a priest in the apostolic vicariate of Sichuan, China, and worked with the Foreign Mission Society of Paris. Because of the persecution of Christians at the time, he worked as a vegetable seller by day, ministered to covert Catholics by night. He was betrayed to the authorities by a local carpenter; he was in the middle of Mass when found, asked for permission to finish, and when it was done he turned himself over for arrest. He was imprisoned, flogged, and when he would neither pay a bribe nor renounce his faith, he was executed. Martyr. Born to the nobility, Angelo became a knight. In 1223 he was in service to Cardinal Leone Brancaleone in Rome, Italy where he met Saint Francis of Assisi. He was so taken with the teachings of Francis that he gave up the military life, became one of the first spiritual students of Francis, and one of the first twelve Franciscan friars; he was the first knight to join the Order. One of the authors of the famous Legend of the Three Companions about Francis and the early days of the Franciscans, he nursed Saint Francis during his final illness, and was singing the Canticle to him when he died. 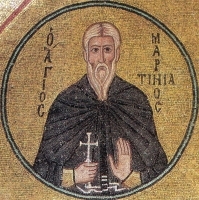 Spiritual student of Saint Maximinus of Trier. Priest, ordained by Maximinus in the mid-4th-century. 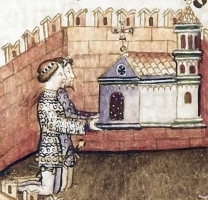 Hermit at Karden in the Moselle river region where he ministered to other hermits and small religious groups, including Saint Potentinus his sons Felicius and Simplicius. Pious youth who early decided on a life in the Church. Priest. Bishop of Lodève, France for 57 years, consecrated on 4 February 949. Rebuilt many churches and convents. Founded the monastery of Saint Sauveur, and several hospitals for the poor. Untiring reformer and supporter of the spiritual life of his clergy, known for his personal asceticism. Born a princess, the daughter of King Erconbert of Kent, and Saint Sexburga of Ely. Ermenilda was a pious youth with a strong prayer life. Married to the pagan Wulfhere, King of Mercia whom she converted by setting a good example. Queen. Mother of Saint Werburga of Chester and King Coenrad of Mercia, who abdicated to become a monk in Rome, Italy. Ermenilda used her royal influence to destroy the last of Anglo-Saxon paganism. When widowed, she became a Benedictine nun at Minster-in-Sheppy abbey, which had been founded by her mother. She served as abbess there and at the abbey at Ely, England. Priest in the apostolic vicariate of West Cochinchina (modern Vietnam). Martyred in the persecutions of emperor Tu Ðuc. Two brothers who founded the convent of Saint Victor in Meda, Italy. Raised in a pagan family, at age 15 Fusca converted to Christianity and was baptized along with her nursemaid, Saint Maura. During the persecutions of Decius she was ordered by her family to renounce the faith; she refused. Arrested and tortured and ordered to sacrifice to idols, she refused. Martyr. Member of the Irish royal O'Neill clan. Monk. Spiritual student of Saint David of Wales. Beekeeper while a novice. When he returned to Ireland, a swarm of his bees followed his ship. Hermit at Tibraghny, Kilkenny, Ireland. Bishop of Ossory, Ireland. 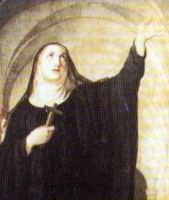 Lay woman who gave Christian burial to the Martyrs of Turin in 297. Mercedarian preacher in the Spanish cities of Granada, Valencia and Murcia who was noted for his prison ministry. Ransomed 358 Christians who had been enslaved by Saracen invaders. Studied at Saint Quentin. Archdeacon and then bishop of Meaux, France in 995. Bishop of Vercelli, Italy in 978. Murdered for political reasons by the future king of Italy, Arduin of Ivrea. Spiritual student of Saint Anskar. Worked as a missionary with Saint Nithard. Bishop of Osnabruck, Germany from where he supported more missionary work in Sweden. Abbot at Rieti, Italy. Pope Saint Gregory the Great describes him as "rude of speech, but cultured of life". Stephen devoted himself almost wholly to prayer, and was known for his concern with the spiritual lives even of those who wronged him. Tenth century bishop of Carcassone, Narbonne, Gaul (in modern France). Priest and Benedictine monk at Ely, England under Saint Etheldreda. After Etheldreda's death, Huno retired to a hermitage in The Fens region of England. Bishop of Lyon, France. Worked to convert the Arian Burgundians to orthodox Christianity. Priest in Todi, Italy. Martyred in the persecutions of Diocletian. 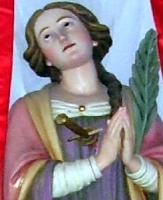 One of the 140 saints memorialized on the colonnades in Saint Peter's Square. Nurse to Saint Fusca of Ravenna. Martyred in the persecutions of Decius.